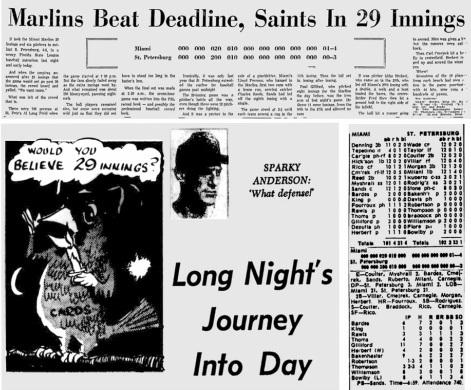 Just a year after the city of St. Petersburg extended the curfew for baseball past midnight, their Florida State League team, the Cardinals, set an organized baseball record for longest continuously played game, 29 innings, in a marathon against the Miami Marlins at Al Lang Stadium. The game began at 7:30 a.m. with 740 fans watching and ended at 2:29 a.m. with just 150 still in the stands, according to the Miami News. The Miami News headline writer must have been tired, too, and apparently forgot that St. Pete's Florida State League team was the Cardinals and not the Saints. After 25 innings, the umpires announced the game would not go past 30 innings, prompting the remaining crowd to boo and yell, "We want more." Spectators on hand at the end included some who left local taverns when they closed at 2 a.m., noticed the still-lighted ballpark and walked in through the unmanned gates, the St. Petersburg Times reported. Tied after nine, each team scored a run in the 11th inning, then settled in as the defenses battled for 17 scoreless innings. Marlins pitcher Paul Gilliford had pitched eight innings for Miami just the day before and pitched 11 more innings in this game, from the 18th to the 27th, allowing no runs. It ended with a run by pitcher Mike Herbert, who came on in the 27th. The game beat the previous record of 27 innings set in May 1965 by the Elmira, N.Y. and Springfield, Mass., teams of the Eastern League. The Cardinals were managed by Sparky Anderson, who would manage his way into the Hall of Fame with World Series wins for Cincinnati Reds and Detroit Tigers.